We still can't believe that loss. If anyone tells The African Queen again that "It's Joel Hanrahan's Time Now!!" --they better quickly move out of her way. Because Our Number 38 is no closer--at least not yet. And who said a mediocre ball club doesn't need a closer? Well, Our Washington Nationals need one RIGHT NOW!! Because this stuff is getting way out of hand. To pitch with the game on the line, you need to be able to handle pressure. Joel Hanrahan seemingly has not learned that lesson yet. Someone in our bullpen needs to learn that lesson. There is no excuse for losing this game tonight to The Philadelphia Phillies at Citizens Bank Park. When you slam out five home runs, twice pull ahead by four runs and you still can't win late--there is something wrong. And to recall, twice Washington left the bases loaded in the 6th and 8th Innings. But surely, we were going to win. Maybe the hardest defeat we have ever watched involving Our Washington Nationals. Shairon Martis is 22-Years Old and still learning how to be a professional player. HIs poor pitch selections in the bottom of the 5th tonight that allowed The Phillies to tie this game up at six apiece can be chalked up to inexperience and poor execution. Ryan Howard taking advantage of a rookie throwing him the exact low breaking ball The Former NL MVP & Home Run Champion can punish. A Grand Slam that got Philadelphia back in this game for the first time. The Big Blow that again came back to haunt Washington when Hanrahan relieved a struggling Garrett Mock with two outs in the 8th, Washington still up two, Chase Utley on first base. All we needed was one out. ONE OUT--and Our Number 38 couldn't find the plate. Afraid to pitch to Ryan Howard, Hanrahan walked him. Unable to locate his fastball, Joel walked Jayson Werth to load the bases. Trying just to aim a first pitch fastball over the plate to Raul Ibanez--found the Lefthanded Philadelphia Slugger slamming that juicy pitch over the rigthtfield wall for the second grand slam of the evening. On the heels of Ryan Zimmerman crushing two home runs this evening. Elijah Dukes sending the longest fly we've ever watched set sail at Citizens Bank Park into Ashburn Alley--The Centerfield Plaza of the South Philly Ballpark for his 3rd Home Run Of The Season. A Titanic Second Deck shot to right off the bat of Nick Johnson (his second homer of 2009) and finally Adam Dunn's 5th Tater--YOU HAVE TO WIN THIS GAME!! Stunning. Simply Stunning Our Washington Nationals DID NOT. And it's left us Nearly Speechless. Final Score from that pinball machine known as Citizens Bank Park--Philly 13 and Washington 11--in demoralizing fashion. 10 Hits, 10 Runs, 9 RBI from the top five hitters in our lineup tonight. And believing his bullpen would shut the door, Our Manager Manny Acta rightfully replaced Adam Dunn in the bottom of the 8th with the far better fielding Justin Maxwell now playing left. A move that turned against him when The Phillies rallied to take the lead in their six run 8th and Adam Dunn was sitting on the bench as the final out was recorded--a strikeout by his replacement-- Justin Maxwell. Amazingly, there were no fielding errors charged tonight, even though Austin Kearns, Adam Dunn and The Phillies Shane Victorino all misplayed fly balls off their gloves. No one really pitched that well tonight for Washington. Martis got hammered. Julian Tavarez allowed an inherited runner to score. Mike Hinckley looked lost again on the mound, but somehow got out of a jam. Kip Wells did pitch a scoreless 7th, but Mock set the fire that became the 8th inning. And Joel Hanrahan added the fuel which exploded this game. Our Washington Nationals can't trust their bullpen, and it's taking away most every realistic chance to win. One of those winnable games--thrown away by pitching, pitching and more poor pitching--again. Finally, If there is one thing to take from this terrible loss--it is the very fact that since Baseball Returned To Washington in 2005, Our Washington Nationals and The Philadelphia Phillies have played some of the most memorable games between each other than with any other team. Win or Lose--noteworthy stuff. Ball Games that are remembered for years to come. This one certainly fits that billing. No question--The Phillies are truly our rival, both on the field and in the stands--and this 13-11 defeat just added to that mystique. What a nightmare! I should have gone to bed early instead of staying up to watch that. It would have been a far better use of my time. "Tonight's InGame Photo--H.Rumph, Jr. (AP)"
Yet another morning in which I wake up desperately hoping that the Lerners sit down for an entire weekend with Ted Leonsis and learn how to both build AND market a franchise effectively. Hanrahan looks scared out there. I don't see any confidence in his eyes. It reminds of Calvin Schiraldi for the Red Sox in 1986. He is not ready to be a closer. But we are really handicpped. What choices do we have ? What choices does Manny have ? Do we do another Syracuse shuffle to repeat the experience in another 2-3 weeks ? This is where I disagree with some posters here. Manny is not throwing these pitches. He is calling on the most "trustworthy" relievers he has. They are showing by their performances that they are not major league pitchers. Is there anyone at Syracuse who is, or can be converted to a closer ? And we still need set up men. I thought Mock might be the 2nd best bet to groom as a closer, but he seemed just as incapable of throwing a strike as Hanrahan. On the plus side, you have to love the offense of the past few days. When Kearns and Flores are contributing, and we get our real middle infield back, we should score some runs. But it seems we're lacking (at least) half a pitching staff. Despite last night's debacle, I will be watching and listening tonight with whole-hearted devotion to the Nats. Can the Mayor of NatsTown pitch every other day??? Pleeezzzz? The Post-Game show on MASN looked like Ray Knight has reached his boiling point. Personally I like the offense as that is what we were complaining about this time last year. When Beimel gets back, he will help to get this bullpen back on track and maybe close. Kip Wells was a good decision. Tavares is solid. Hinckley is a lefty specialist when the game isn't on the line (thank goodness that line drive from Ryan Howard went right at Nick Johnson)or 3 runs score there. It is no secret I am a fan of Joel Hanrahan. So here is my excuse for Joel-he is not good in situations when he is coming in to clean up someone else's mess and that threw him off. Sure, he has created his own messes too. I expect that Joel is going to move down in the rotation and Kip Wells will close--just my guess (until Beimel comes back). Bergmann and Mock haven't been effective in their relief appearances. While I originally agreed with Manny, leaving the closer role to Hanrahan after the Florida collape(s), last night was just too much. Recent memory has proven that the MLB closer role is somewhat based on mental toughness. We saw what happened in Boston when Keith Foulke lost it, we saw what happened in Eric Gagné in Texas. Hanrahan can not continue to be the closer for this team. He no longer plays confident baseball, and Manny Acta needs to make a change ASAP. Bergmann should be given the first shot as closer from who is currently on the staff. He's has great stuff and could be good at the job. Just throw him out there. Really, what more do we have to lose? This is getting to the point where you just say, forget this. First Manny needs to be fired. Rod Dibble said it best during Saturday's ugly game in New York, why are we not taking infield to improve our errors? Well that’s because Manny does not make them take infield. After I heard that, I lost all respect for Acta. FIRE ACTA, ASAP. Put Riggleman or Eckstein as Manager for the time being. Pitching WINS BASEBALL, we have 2-3 MLB pitchers on our team and thats its (J-Z, Lannan, & possibly Martis). Cabrera needs to finally be passed up on, he is not an MLB pitcher. Well in the bullpen there is not one pitcher we have that is good. I will make a case in point for Jason Bergmann, give him two weeks of being the closer, if he fails we all know then he is not a closer. Hopefully Beimel comes back soon. D) Make Saturday more Day games; you just might get a better audience. I can go on, but I am a marketing guy and you guys will need to do something if you continue to lose like this. Any my final statement, if your offense knows they can't win even if they score 11 runs, they soon WILL QUIT ON YOU. It's almost May and we are 6.5 games out, Season is almost OVER. If we play like this in May (and we will) Season over by May and you will need all the marketing and promotions to salvage this season. In the off-season Takashi Saito, the closer the last 3 years for the Dodgers was a free agent. Last three seasons he racked up 24, 39 & 18 saves with an ERA under 2.00. Yes he is old and was coming off arm trouble, but did the Nats take a flyer on him? Of course not. Instead he is doing fine as a set up guy for Papelbon pitching for the Red Sox for $1.5 M. That is the same amount of money we are paying Josh Bard and $3.5 million less than Dmitri Young. Too expensive you say? The Nats are #27 out of 30 teams in payroll in 2009. Bergmann should be given the first shot as closer ..... Really, what more do we have to lose?What do we have to lose? 1 more game. I could be wrong about Bergy but I don't see it. Beimel when he gets back can close as he has the mind-set for it. I know that Joel Hanrahan can do it. He has the stuff. It is a confidence thing. Maybe we should get Dibble out of the booth to come in to relieve some of these messes. How did we not try to acquire one of the FA closers who were on the market this year?? Mystifying. Last night's loss reminded me of a game I listened to as a nine year old boy in California on May 23, 1970. According to BaseballLibrary.com, "Giants manager Clyde King is fired following a 15-inning 17-16 loss to San Diego in which they blow an 8-0 lead. Charlie Fox is named as the new skipper. A 15th inning HR by Huntz‚ one of 9 homers in the game‚ ends the 5 hr: 29 minute affair." That game and its aftereffects have always stuck in my memory. Last night seemed like a Clyde King moment. To have gotten an 11 to 7 lead in the 8th inning and then LOSE 13-11 is just unbelievable. In 1970, Horace Stoneham told Clyde King to pack up and hired Charlie Fox and the Giants won the division the next year. Was it King's fault the Giants pitching stunk in 1970? Probably not. 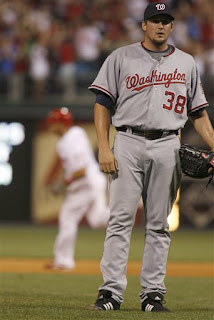 Is it Manny Acta's fault the Nationals relievers are so dreadful? Probably not. But eventually a change is made and it may not be fair but the manager is often the one to go. At least it shows that the ownership takes the losses seriously. Eddie Jordan had guided the Washington Wizards to great success over the last five years, and yet he was fired in 2008 after a bad start. So, perhaps it's time the Nationals tried someone new. I think it's unfair to say Tavarez let in an inherited runner, it was more the two stooges who couldn't figure out who should get the pop up. Adam Dunn's lame attempt at a catch didn't help either, truly Julian should have been out of that inning with no damage if this team had any concept of defense. Anyone looking for help in the farm system that we have been told by Kasten to build all our hopes on should note the Nats AA Harrisburg team is 2-13 (.133 winning percentage), even worse than the big club. The Nats @ .222 winning percentage are currently running ahead (behind) the 1916 Philadelphia Athletics who set the record for all time losing percentage for a season @ .235 (36-117). Since 1903, only 21 teams have ever finished with a winning percentage below .300. I would like to agree with you about Bergman but I think he has the same issues as Mock and Hanrahan. They are good guys but they go "deer in the headlights". Has anyone thought about Zach Zinicola. I thought at one time Bob Boone thought he was major league ready. They don't need to use the usual suspects for a closer. They are hitting so well but fielding and pitching are pretty well awful. As a big Joel Hanrahan fan, even I have to admit he needs to be removed as closer. Not that he could be the closer, but I never understood why they cut Shell loose so quickly; he seemed to be an ideal 8th inning guy. I wonder if Sutton leaving has anything to do with Hanrahan and Shell's struggles; I know he worked with both last year. I think Biemel is your only option as closer; Bergmann does not have the makeup to be the closer. Unfortunately, nothing will change until Manny gets the ax. Not his fault as he is doing the best he can with what he has but it is obvious he has lost the team. If only the Lerners would pay to bring Bobby Valentine back from Japan. Ladson now reporting that Hanrahan is out as closer. Closer By Committee until Joe Beimel comes of the DL on May 6th. John R. Love your Clyde King Story. It's amazing how as kids one game can be recalled like yesterday. Will the last fan at Nationals Park please turn out the lights. NatsGuy: This team is not going be abandoned just because they are playing poorly. There are a tremendous amount of diehard fans that will support this team. And when Washington starts winning, everybody else is going to jump back on board and say they never doubted any of this. Hanrahan needs some time away from the closer role to work things out, but he could be back in the role sooner than many think. The bullpen has been an absolute disaster and has been a big reason why Washington has struggled to finish off games. Unless they can shore up the back end of their bullpen, the Nats won't get anywhere this season.